AG’s Zero-Corner Bi-fold Doors can turn any dark corner into a light-filled entertainment space and provide a wide open, panoramic view with no supporting post at the corner. 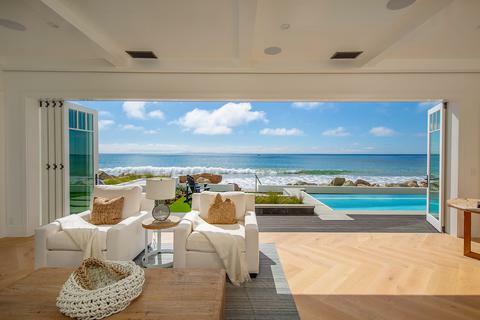 AG’s Window-Door Combinations consist of bi-fold doors and bi-fold windows which connect at the center, and transform an ordinary space into an indoor-outdoor paradise. 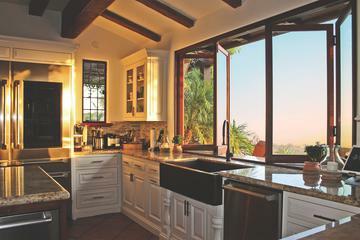 AG’s Bi-Fold Windows create a foldaway “passthrough” window which connects kitchen to patio, creating an additional dining area and enhancing your entertainment space. AG builds beautiful, high-quality custom Transom x Bi-Fold Combinations without risk of deflection! We build transoms to match the ones already in your home! 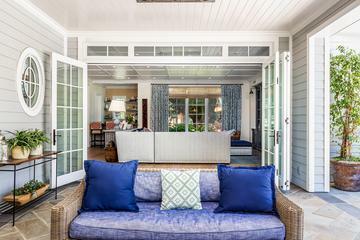 When exposure to sun and rain is an issue, opt for Aluminum Clad/Wood Patio Doors. 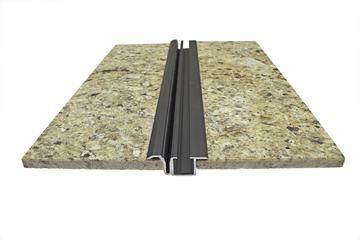 We combine a sleek, tough, low maintenance exterior of 1/16" thick extruded aluminum with a rich, warm, all-wood interior to give you the best of both worlds. 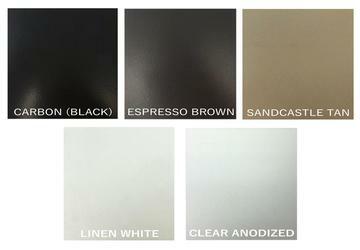 AG offers 5 standard clad color options. Clad exteriors are painted with 70% kynar 500 and meets a 2605. 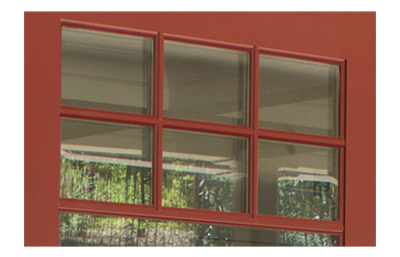 We’ll match any manufacturer’s exterior clad color to ensure a consistent look between our products and theirs. 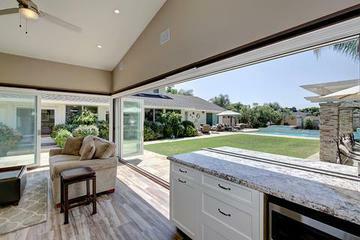 Stunning Bi-Fold Doors deserve stunning hardware. We offer an array of styles and finishes, from traditional to modern, tasteful and refined to complement any decor. Well designed for ease of use with durable craftsmanship for long lasting quality. 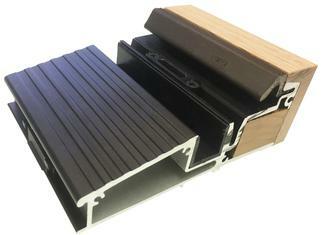 Download a Bi-Fold Hardware Brochure. 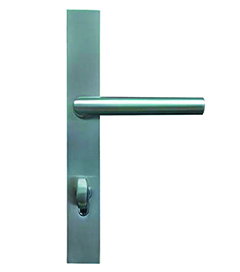 You can also pair our standard multi-point lock system with Series-5 compatible handle sets from many other manufacturers. 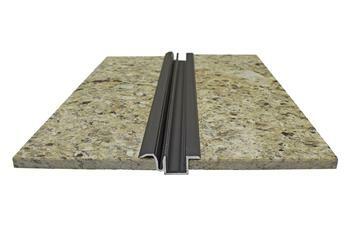 Bi-Fold Systems come standard with our raised aluminum sill and are extremely weather-tight. *Appropriate for extremely low-exposure environments only; no warranty for water penetration with this option. 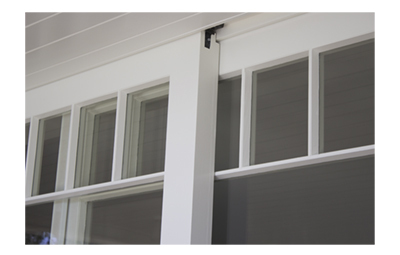 Only AG Millworks offers a low-profile Bi-Fold track system that is ADA compliant and suitable for commercial and residential Bi-Fold Door openings! This sleek, narrow track system provides minimally visible components, a clean groove for the shoot bolts to lock into, and overlapping lips conceal any rough edges on the groove in the finished floor. 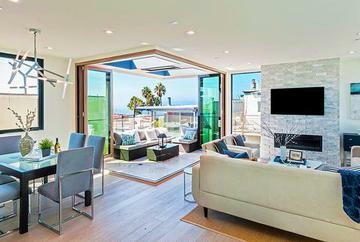 Pair your Bi-Fold Doors with an innovative and functional retractable accordion screen. This is the perfect solution to screening large openings to protect your home from insects and other unwanted elements. With a span up to 32' wide* by 10'6" high, the versatile pleated screen is your answer to deter bugs while preserving the indoor-outdoor feeling! Your optional retractable accordion screen is factory installed and integrated into the jamb, saving you time and money on installation. 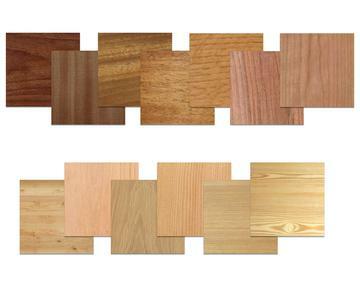 True Divided Lites (TDL) are available on all-wood products. Whether you want a dramatic stained interior or a crisp white cottage feel, AG Millworks has the interior wood species that's right for you! We'll even make your door with different wood species on inside and outside surfaces! 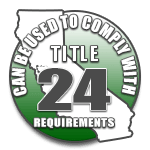 *Warranty and overhang requirements vary greatly between all-wood and aluminum clad doors. Before making a decision, LEARN MORE HERE. Our Bi-Fold Door Systems are available in numerous configurations depending on your design needs. Doors can fold to the left or right side, and open from the center. 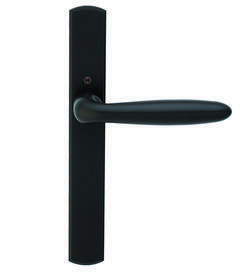 Systems with an odd number of doors feature a convenient single "daily door" that swings open easily without folding all of the doors out of the way. *Please be advised that some door configurations have NO exterior access, and NO "daily door." 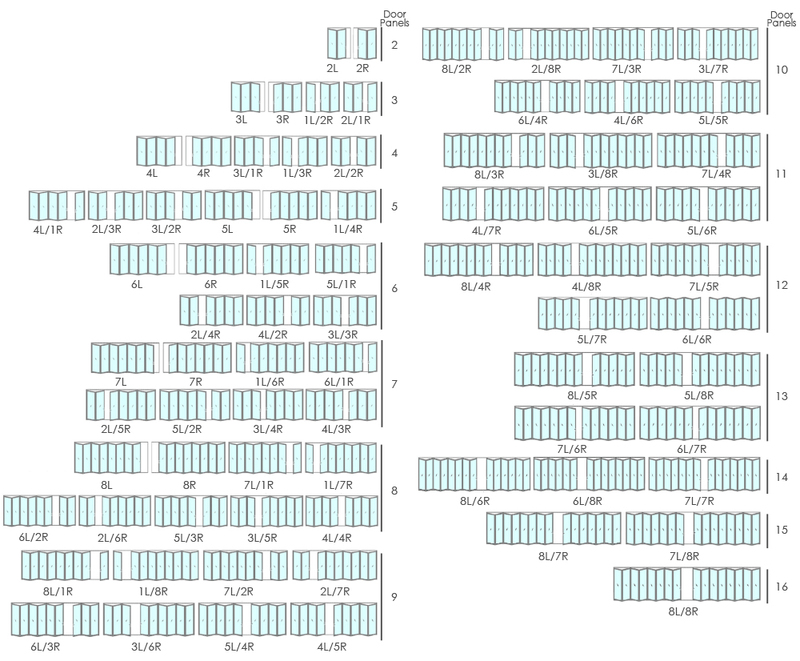 AG Millworks cannot change the configuration once shipped.